7 flossing tips and pointers- How often? | Kind of floss. | Before or after brushing? Details about what to do and keep in mind when you perform your flossing duties. A) How often do you need to floss? For most people, especially those in the first half of their life, flossing just once a day should be enough to keep them in good oral health. The general idea is that once you've cleansed a tooth's surface it takes on the order of about a day or so for dental plaque to reform to the extent that it's able to challenge the health of your mouth. Older adults who have experienced gum recession, or anyone who has areas where food and debris tends to trap, they may find that the only way they can get their mouth thoroughly clean after meals is by including flossing with their usual brushing routine. Don't confuse flossing frequency with effectiveness. Probably every dentist has a few patients they can think of who vehemently state that they floss their teeth multiple times per day, maybe even every time they brush, but to look in their mouth one would never guess it. The explanation for these cases is that the person probably does floss as often as they say but none of their individual sessions involves using effective technique. And as a result, their oral health suffers. With these types of cases, the person might reap significantly greater benefit by flossing less frequently (and possibly even just once a day). But when they do floss they put in the time and effort to do it effectively. B) When is the best time to floss? Following in line with what we've just stated, the absolute best time to floss your teeth is during that part of your day when you have enough time to do it properly. Flossing at bedtime can be a good idea. It's easy enough to make the case that if your schedule allows, flossing before you go to bed makes the best choice. However, if you find that you simply do not have the time or inclination to do a thorough job before going to bed, and at another time of day you would tend to, then hands down go with the latter. C) Should you floss your teeth before or after brushing? It doesn't really matter whether you brush or floss first. What does matter is that you do a good job of both. There is a school of thought that suggests that flossing first makes the best approach. The idea is that your brushing activities will help to remove any items (i.e. plaque and debris) that your flossing efforts have dislodged but still remain around your teeth. Which ever way you go, it does make a good habit to rinse your mouth out with water or mouthwash after you've flossed. Doing so will also help to remove loosened debris. D) How long does it take to floss? The amount of time that it takes for you to floss your teeth will simply depend on the level of skill you have and the challenges that your mouth offers. You can expect that when you're first learning, each session will seem tedious and frustrating. As time goes by however, your skills should improve and things should go much more quickly. At that point, it will probably only take a minute or two of your time. Considering all of the benefits that flossing brings, not to mention simply how much better and cleaner your mouth will feel, the time it takes is really a ridiculously small amount of time. Look for other things to do when you floss. As you become better at it, there should be a point where you find that flossing your teeth becomes second natured. For example, you'll probably find that you no longer need to look in a mirror when doing it. Try to come up with some other activity you can do at the same time. This can be a time saver as well as a way of ingraining your habit into your daily schedule. As an example, many people watch TV while they floss, often in front of other family members. And to those who may find that last point offensive, we'll simply state that when you're at a point where your flossing efforts have produced their benefits and flossing is no longer a cumbersome, bloody, smelly event, doing it in front of other people is quite the non issue. E) Can using mouthwash replace flossing? No, we're sorry to have to report that it can't. We have an entire page that explains why. F) What kind of dental floss should you use? There's no shortage of different types of flosses to choose from, including waxed, unwaxed, string, ribbon, flavored, unflavored, and teflon, just to name a few. Generally speaking, you can be effective using most any of them. This of course assumes that the type of floss you have chosen even remotely approximates the needs you have (see "Options" below). We would argue the case that the best kind of floss to choose is simply the one you find easiest to use. That's because the easier the process is for you, the more likely you are to do it and do it right. 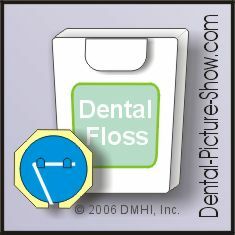 Here are some characteristics and applications for some of the different kinds of floss products. If the spaces between your teeth are large, look for a larger, thicker type of floss. Dental tape, fluffy or yarn-like flosses typically make a good choice for this type of situation. Attempting to be effective with extra-fine floss would probably be exceptionally frustrating. If the contact points between your teeth are especially tight, try using a waxed or teflon floss. Regular unwaxed floss can make a good basic all-purpose choice to start with. Then, depending on what you've experienced, you might choose a thicker or finer diameter product to better serve your needs. If the individual strands of your floss tend to snag or shred, you might consider a waxed or teflon product. Of all of the types of flosses, unwaxed may offer the highest level of cleaning effectiveness due to the fact that its strands tend to splay out when pulled against a tooth's surface, thus maximizing it's degree of contact and therefore cleaning efficiency. G) Flossing aids and tools. You may wonder if using floss holders, flossing handles, or electric or pre-threaded flossers has any merit. What do dental professionals use? We'd expect that most dentists and dental hygienists would tell you that they personally feel that they can do a better job when flossing "by hand." At least a part of this opinion would likely be based on their belief that they have greater control over the extent and method to which the floss is worked around when doing so. Flossing aids can have merit. Beyond that, if using some type of flossing aid means that you will now floss, or flossing is now possible, whereas otherwise that option wouldn't exist, then yes, by all means, use one. Then as you start to notice the benefits of flossing (like the improvement in the way that your mouth feels) and you have a better comprehension of what it takes to clean in between your teeth, hopefully you'll experiment again with doing things by hand, just to make sure that you don't find that you can do better on your own.